Whether you’re prepping your walls for a new paint job or restoring and repairing any painted surface, it’s almost certain that you’ll need to remove some existing paint around your house or other project. Whatever the case, it can be a hard job sometimes, especially if the paint is old, the original layer or stuck on something with lots of hard to reach textures and surfaces. There are a few ways to get the job done for sure. One solution is highly recommended by far; read on to learn more. Choosing how to remove old paint on your home is easy; you just have a few considerations to help determine what technique(s) to use. It’s true that your options can be complicated or expensive, or laborious and even dangerous…but they don’t have to be any of these. The info below will help you decide which way to go, how to save expense limit your exposure to chemicals or fire hazards) and get the job done successfully. In years past, there wasn’t a way to get old paint off without a power tool or harsh paint thinners. In recent years however, we’ve come to figure out how to more safely dissolve and remove latex and oil-based paints. 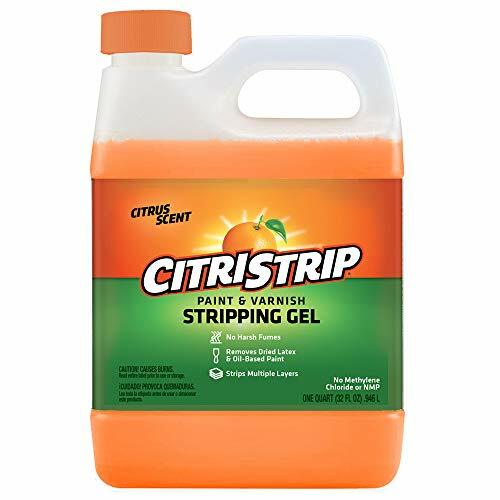 One wonderful product is called CitriStrip, it’s 100% all natural. And unlike other paint remover solutions, it won’t cause irritation to skin, nose or lungs. Believe it or not, this is an organic product that actually does what it’s supposed to on any kind of paint or protective coating including: varnish, lacquer, polyurethane, shellac, enamel, acrylics and epoxy. Further, it does so effectively form common surfaces such as wood, metal and masonry. It also works on stucco and concrete. CitriStrip works great on multi-layers of old paint and even lead paint, which encapsulates the lead as it breaks the paint down. This stuff also easily removes enamel, urethane (staining sealer), epoxy and acrylics. Completely odorless, this solution can be used on wood, metal, concrete, brick, stone and more. 1. For preparation, tape or cover any areas of paint that you want to leave alone. Use painter’s tape and plastic and/or tarps to cover and protect the ground, vegetation or flooring. Expect some minor, slow dripping when putting on walls. 2. To remove paint from walls or objects like furniture you can pour the gel into a plastic bucket for easier access. Use a paint brush size of your choice and simply dip and spread the gel evenly and in an amount that gives a thick coating over the paint to be removed. To remove urethane or epoxy finishes from floors, you can either pour the gel directly or use an industrial turbine sprayer (not air) for really large spaces. If pouring, spread out using an old broom – this works really well. 3. Allow product to sit. This stuff works by penetrating (migrating) completely through the paint layer(s) and dissolving it. This usually takes 30 minutes. It could take more depending on how many layers of paint you have to remove. Simply start checking for paint softness as you wait. If indoors, there is no need to cover the gel coating during this process. If outdoors, cover with thin plastic so the gel has time to do it’s work before starting to dry. 4. Now it’s time to remove everything. A putty knife does the trick as it cleanly grades off the paint and gel mixture together. Scrape right into a bucket or let it fall to to a plastic covering. For floors, you can use a squeegee to move the slosh into a pile, then shovel into a 5-gallon container. A wet-vac can be used too. Just get all remaining residue film removed before going on to the final cleaning step. If necessary re-apply product to get any left-over paint. 5. Clean up and dispose. At this point, you can remove anything left behind. A dry or damp cloth works fine for smaller areas. You can also use a water hose to spray down exterior walls. To go a step further and for garage floors, you can use a basic degreaser to thoroughly cleanse surfaces and prepare for a new coat of paint. While the product is natural, once it’s picked up paint, you’ll want to carefully contain it in heavy-duty bags and dispose properly. This stuff is really easy to use. It’s versatility is not compromised just because it’s a “green” product. Use it on concrete with lead paint, cars or painted chimneys and even fiberglass and veneer finishes. The rest of this article will cover other, more traditional ways to remove paint. Because the above solution works so well, they are not highly recommended. But they are included here for your reference. Scraping is powered by “elbow grease” so it’s best to use the following method when you know you only have small areas of paint to remove. Hopefully you already have some old paint peeling, which will help you get started more easily. The most basic form of scraping involves using a putty knife. Only use this tool in small places, since it’s not your most efficient choice. The best tool for scraping paint off is a pull scraper. Its sharp blade literally shaves off damaged paint down to the bottom surface such as bare wood. 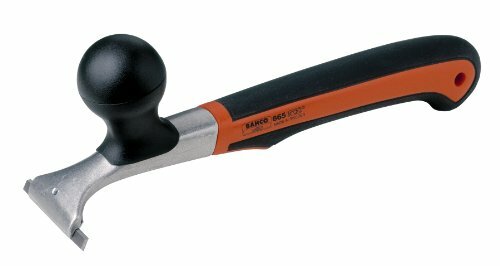 Not all paint scrapers are created equal, so it’s best to spend a few extra dollars and get a quality, heavy duty type like the one below by Bahco, a Swedish company. It’s of very high quality, rugged and versatile, letting you change out blades for different sizes and shapes. This is great if you need to remove paint from curved trim work or coving for example. The blades are carbide, so they are strong (not easily chipped if you hit a nail and won’t wear down from normal use). These really do last a long time, but depending on how big of job you have, you can easily buy replacement blades. Older scrapers and less expensive ones may require you to sharpen the blades over time – this is not nearly as efficient. This scraper is a tool you buy for life, and it’s one you don’t mind using for long stretches either. It’s ergonomic design gives you a comfy grip and fluid motion as you pull off your paint. To use the pull scraper, begin in the area where paint is already coming off the most. Usually you won’t want to start where the surface is intact. Make sure the paint is completely dry. Pull the tool across the surface firmly. This type with the ball on top is the way to go, giving you control and less fatigue during heavy usage. The Bahco will slice off the paint nicely. Be careful not to dig into wood underneath. In places where you want to leave your older layer on because it’s still sticking well, simply feather these edges using the sharp blade. If you do this well, you’ll have limited sanding to do. Some folks simply don’t have it in them to remove paint by hand. Also, you may have a lot of paint to remove or have time constraints, so a fast method may be better: powered sanding. Once you get the hang of this, you’ll have your paint gone in no time. Orbital sanders are best, giving you the most control without risk of damaging wood. Disc sanders can gouge wood (leaving swirls). Belt sanders can work too with a little extra care. Use 80-grit sand paper (open-coat type) to help keep the paper from clogging up with all the tiny bits of paint coming off. Wear a dust mask! Plan on kicking up a lot of paint dust during removal. For metal surfaces like pipes or gutters, use a wire brush. You can get an attachment you put on a drill or rub by hand. One final recommended do-it-yourself way to get your paint removed is with a heat gun or blow torch. If you run into paint that is just too stubborn to scrape off, you can apply a little heat to get it going. Melting the paint a little allows for much easier scraping. Remember the goal is not to “burn” the paint off, but just cook it slightly so it looses its ability to stick. Always use care with a heat method. Keep a garden hose nearby and ready to use should you accidentally create a flame somewhere. This could even be on the ground around where you’re working. Take extra precaution with fire hazards when using an open flame from a propane torch tool. Simply put, toxic paint thinners and strippers are not recommended for use by homeowners. It just isn’t worth the exposure to toxic chemicals that you have to keep around your home. Let the pros use this if you must. But better yet, use the product described above – all natural paint remover– that works just as good, if not, better and save yourself a headache, literally.